This relates to my post, "Indiana has a chance." Take action such as contacting your state legislature here. It was great to be a Boilermaker today, as the University Senate of Purdue joined Purdue Student Government in overwhelmingly opposing HJR-6 (The Marriage and all Similar Institutions Discrimination Amendment). That said, one should note that the President of Purdue (Former Republican Governor of Indiana and individual who is NOT an academic, Mitch Daniels) has stated neutrality. Thus, I would still encourage people to sign the petition asking him to put the university over politics and oppose the amendment. Purdue has now joined the other major universities in Indiana - Indiana University, Wabash, DePauw, Ball State, and Butler - in opposing the amendment. Watching as this effort progresses, I continue with my optimism - Indiana has a chance. Indiana really could defeat this amendment. A lot has changed since these amendments started happening. The streak of states enshrining discrimination in their constitutions has ended. 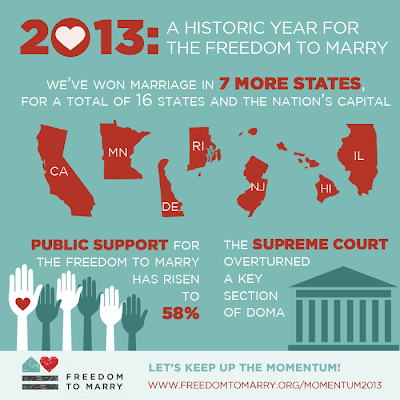 Minnesota defeated a marriage discrimination amendment. Washington, Maryland, and Maine won marriage equality at the ballot box. Hawaii, the state where it all started, now has marriage equality. Legislatures and courts have also expanded the number of states. Public opinion is changing and people are waking up. Image from Freedom to Marry. Note 2013 isn't over, and it is quite likely we will hear from at least New Mexico before we ring in 2014. Indiana has a chance. One should remember that Hoosiers have resisted the amendment for years. Major businesses like Cummins and Eli Lily oppose the amendment. The state's major universities oppose it. Many religious leaders oppose it. Even some members of the Republican Party oppose it. 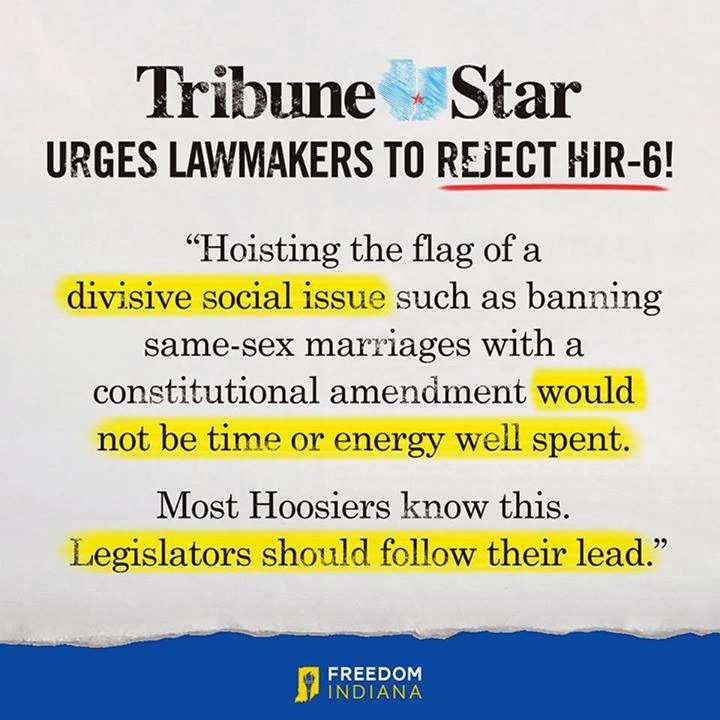 The groups that oppose the amendment are growing every day, and I encourage you to check out Freedom Indiana to find out who has come out against it. 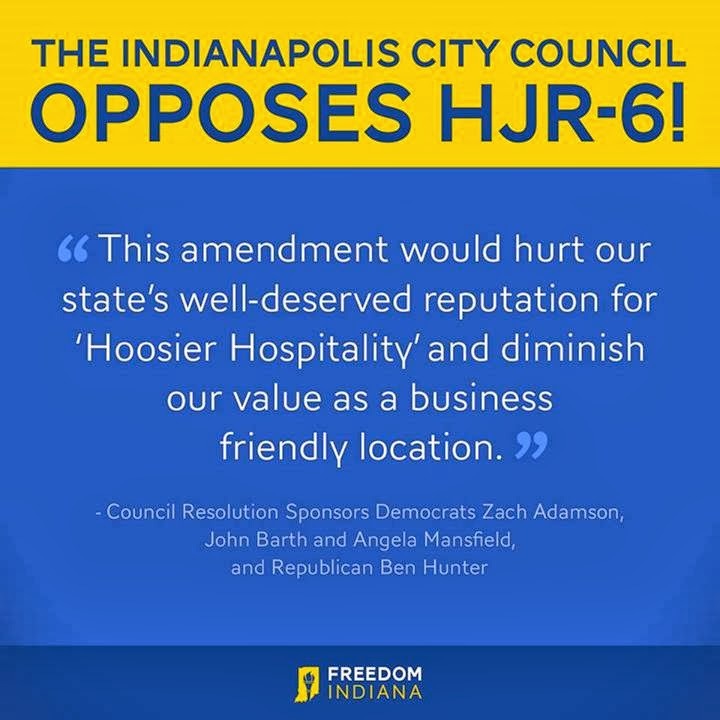 Image from Freedom Indiana, on the Indianapolis city council voting to oppose HJR-6. I think Hoosiers really could recognize the misleading and out-of-state forces that are trying to drive this amendment and reject them. Hoosiers will realize how much damage this amendment will do to the state. 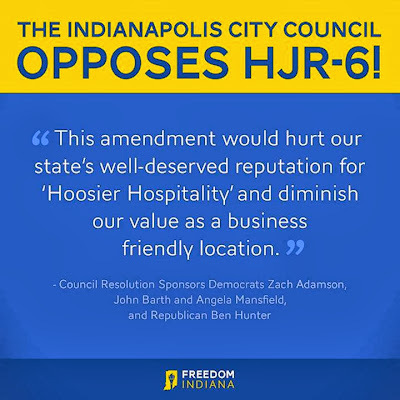 Damage by: leading people to leave Indiana for greener pastures in other states (like Minnesota); causing people to accept a job offer elsewhere because of Indiana's policies; and leading businesses to pass up Indiana because of its policies to name a few. That said, this is a fight. We can't expect those who want to enshrine discrimination (with incredibly ambigious language) into the constitution to play fair. I hope we can stop this before it happens by killing the money wasting ballot question (take action such as contacting your state legislature here). This ballot question will be resource intensive (such as the cost of the legislature's time, the cost to hold the vote, etc), and that alone is a reason to oppose the measure, and to try to kill it early. If it makes it to the ballot, I expect a long, divisive, and expensive fight. 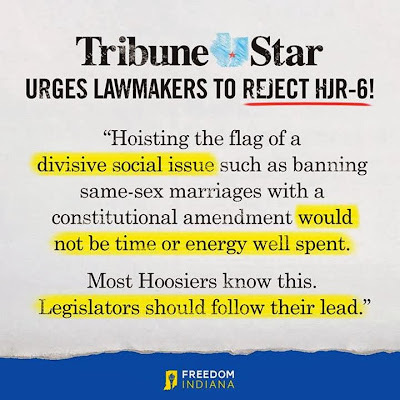 I also expect the Hoosier spirit, and I have hope that the people of Indiana will recognize this amendment for what it is - a force to damage the state and tie the hands of Hoosiers for years to come. The Purdue community has shown it opposes this amendment, and I expect many Hoosiers to follow. Take action such as contacting your state legislature here. Edit 21 November 2013 - Butler added to list of universities opposing the amendment. New Mexico's Supreme Court has issued its ruling making New Mexico #17 (#8 for 2013) with marriage equality.